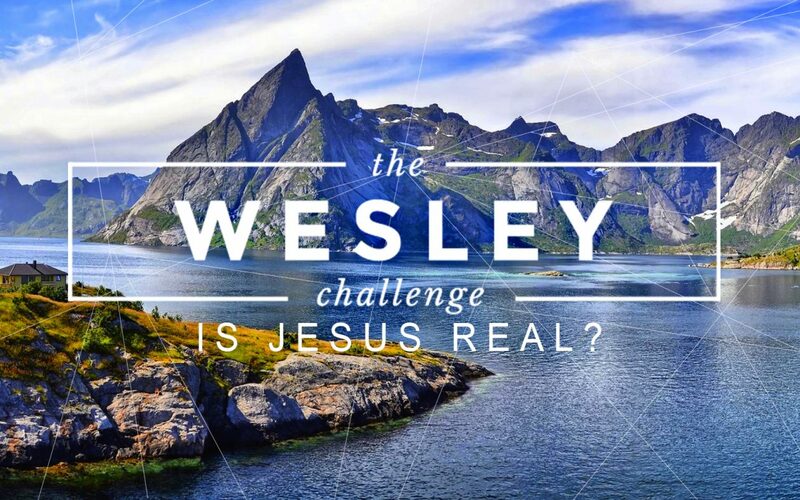 The Wesley Challenge: Is Jesus Real? When I was seminary, the classes I struggled with the most were the Theology classes. I know that many of you will be shocked to know that I am not a very deep thinker. And so I struggled a great deal to understand what these theologians were saying. And the truth was that at best I understood just enough to get by. My saving grace was that we never had tests. Whether we passed or failed hinged on 3 or four papers that we would write during the course of the semester. And so I became a master at stretching very little knowledge and understanding into a ten page paper. Which really has become my greatest learning from those classes in these years of ministry – how to stretch very little substance into a 25 minute sermon! Well, for one of those papers we had to pick a theologian and do a thorough analysis/critique of his or her theology as we understood it. We were free to choose the theologian, but we had to clear our choice with the professor before we started working on the paper. So I met with him and told him that I intended to write about the theology of John Wesley. And he responded that though he had the greatest respect for Wesley, he didn’t really consider him to be a classical theologian. And I replied that millions of Wesley followers all around the world, whose faith was based on the theology of Wesley would disagree and though he certainly might not be a classical theologian, he would certainly fall into the category of a practical theologian, and that as a United Methodist pastor I feel like I am called more to a practical theology than classical. Well, he gave in and I did my paper on the theology of John Wesley and I used as my major source these accountability questions that Wesley organized the first Methodist Societies around, which are the basis of our church wide study. And Wesley began with the question of the reality of Christ. Wesley asked it this way: Is Jesus real to me? but I really think the better way to ask that question is: What makes Jesus real to me? Because essentially I think that is the question that is at the heart of this passage of scripture. John the Baptist is reaching out from prison and questioning whether or not Jesus is real. Are you really the one or should we be looking for another reality? Now on the surface this appears to be a question that comes out of John questioning his faith. Which is usually the way we approach this passage. And that would certainly be understandable. But as I thought about this passage in the light of John Wesley’s question, it seems to me that John might be having a crisis of belief as much as a crisis of faith. You see, John had spent his whole life watching and waiting for the Jewish Messiah. Tradition has it that John’s parents died when he was very young and he had been taken in by the Essenes, a Messianic sect that formed the community of Qumran which was located on the edge of the wilderness, near the place where the Jordan river flowed into the Dead Sea. Now the Essenes were the classical theologians of the 1st Century. They spent nearly all of their time studying and transcribing the ancient texts, especially those having to do with the coming Messiah. It was the Essenes who produced the Dead Sea Scrolls and put them in clay jars and stored them in the caves in the limestone cliffs above their Qumran community. It was a secluded, monastic existence in Qumran that John was adopted into. So John understood the Messiah from a classical theological perspective and when word got back to him in prison that Jesus was not fulfilling the Messianic prophecies in the way that he understood them from his study of the ancient texts, he began to doubt that Jesus was actually the one they had been waiting for. And so he sends a couple of His disciples to Jesus and asks the classical theological question: Are you real? Are you really the Messiah we have been waiting for or should we be looking for another? Now what we need to understand is that in Jesus day, Messiah’s in Israel were a dime a dozen. The prophecies concerning the Messiah always arose in times of great oppression and even captivity. Don’t despair, the prophets would say, because a Messiah is coming that will lead us out of our dire circumstances and restore Israel to it’s former glory, just like King David had. So they believed that the Messiah would come in the line of David and like David would be a great warrior who would rally the people and they would overcome the foreign invaders and Israel would once again be the promised land of God. In John’s day the oppressors were the Romans and the belief that the arrival of the Messiah was eminent was strong. And the number of persons who rose up and claimed to be the Messiah, the great warrior who would lead the Jews to victory, were numerous. And in fact, there were many who believed that when John emerged from the wilderness around Qumran and started baptizing in the nearby river Jordan, that John himself was the Messiah. So now in prison, John was having his doubts about whether Jesus was really the “one” or not. You see, as I have read this story again it has occurred to me John’s doubts were more theological in nature, rather than a wavering faith in the coming Messiah. Jesus was not acting like the Messiah that John had come to understand in his classical study of scripture and prophecy. John’s is more of a question of the mind, then the heart. But I don’t think that Jesus was a classical theologian. He was a practical theologian. So He did not answer John by trying to show how He fit into the ancient prophecies and scriptures. In fact, He didn’t really answer John’s question at all. Instead, he told the Disciples to go back to John and just tell him all that you have witnessed and let John draw his own conclusions. I think Jesus’s response transforms John’s question from “are you real to me?” To “What makes you real to me?” For Jesus the truth of His Messiahship is not going to be found in the ancient texts, but rather it’s going to be found in the blind who can see, and the lame that can walk, and the lepers who are cured, and the deaf who hear, and the dead who are raised, and the good news that is proclaimed. Those are the things that makes the Messiah real. Jesus was a practical theologian. His understanding of Messiah was much different than that of the learned Jews, which led to a great deal of conflict with the priests, who were more classical theologians. Jesus’s was a faith of the heart more than the head. Jesus was not concerned with prophecies concerning God, as much as He was with a relationship with God. Chris Holmsbee writes: Praying and reading a Bible in order to check off a list or fulfill a duty is not what Wesley (or Jesus, for that matter) had in mind. Instead through a lasting commitment to practices, we are gradually formed into the true image in which we’ve been created. When Christians learn to practice Christianity in the way of Jesus, it turns them upward. This means that our focus becomes our relationship with God. And in contrast to the church of his day, like Jesus, Wesley believed that faith begins with our relationship with God and that the only way for us to be in true relationship with Christ, we must first be recipients of his grace. And so, he said, to truly experience that grace we must practice what he called the means of grace, which include prayer, and scripture, and righteousness, repentance and forgiveness, among others. For Wesley, faith and belief was not about religion but rather about relationship. And so the first seven questions he posed to those first Methodist societies were all about our relationship with Christ. And so the first question was: Is Jesus real to me? Every day before we shut down for the night, we should ask ourselves if Jesus was more real to you today than He was yesterday. If so, then we are growing in our faith and in our relationship with Him. So what is it in your life that is making Jesus more real to you? And what do we need to do and say to make Jesus real in the lives of others. Chris Folmsbee states that Wesley wanted Christians “to make sure that we are not simply partaking in a religion, but that we are experiencing a relationship with Jesus.” Being a disciple of Christ is all about experiencing Christ as a person and being in relationship with Him. That’s when He becomes real to us. So how do we enter into a relationship with Jesus. That’s what the rest of these questions are getting at. It is through these various “Means of Grace” that we enter into relationship with Jesus. So the second question is: Am I enjoying prayer? That’s an interesting way to ask the question isn’t it? You see, prayer is not meant to be rote recitation of the prayers of others. A duty or an obligation. We spend a lot of time coming up with formulas and programs that we think will help us to pray on a regular basis. But we don’t need those, when Jesus is real to us. Our prayers need to come from the heart and not the mind. When Karen and I were first in love, she was in school in Oklahoma and I was in Kentucky. And I couldn’t wait to see her, to hear her voice, to talk with her. We kept the phone company in business, running up the long distance phone charges. Those phone calls brought great joy in those long days of separation. Well that is the way it should be in our relationship with Jesus. Prayer is the means of grace that allows us to bridge the separation between us and God. It brings us great joy. This question is all about that joy we find in being in relationship with Jesus. Do you find joy in your prayer life? Wesley was essentially asking what your prayer life is saying about your relationship with Christ? Then the third question is: Do I insist upon doing something about which my conscience is uneasy? I think the 5th question is the same question, only asked in a little more direct way: Did I disobey God in anything? These are all about temptation and sin, and repentance, and forgiveness and grace all wrapped together in one big bundle. Paul expressed the essence of these questions in this way to the Romans: I do not understand what I do. For what I want to do I do not do, but what I hate, I do. Here’s the point that I think Wesley was making with this question. Our relationship with Christ will not shield us from temptation. Temptations will come. This question presumes that we will be tempted by the things of this world and will sometimes give in to those temptations. But the point is that the more we fill up our life with Christ, the less room there will be for the temptations of the world. Paul writes that what he really is seeking in life is more of Jesus and less of him until all there is is Christ. The grace of Christ does not keep us from temptation and the wrong choices we often make, but it does see us through the temptations of life even when we give in and do what we hate. Is your life a reflection of the grace that is at the core of our relationship with Christ? Then the fourth question: Did the Bible live in me today? I love what Chris Folmsbee writes about this question when He says: I’ve learned over the years that engaging the Bible is more about intimacy, not literacy. Reading the Bible for knowledge of God is one thing. Allowing the Bible to read you for transformation is altogether different. We often say that the Bible is the living word of God. At the beginning of His Gospel, John writes: In the beginning was the Word and the Word was with God and in fact, was God. All things came into being through the Word.” But do we really believe that. I think this question is really asking “What have I done to make the Bible come alive in me today?” What have you done, or what will you do, today, to make the Bible come alive in you. The seventh question returns to the question of the living word of God and whether the Word lives and speaks through us. Wesley asked: Do I give time for the Bible to speak to me (and through me?) every day? How is God speaking through you today? These questions caused me to remember my high school friend George. George gave off the impression of being very religious. He was what we called a Jesus freak back then. He wore a huge cross around his neck. And he carried a big Bible everywhere He went and read it and quoted it often. But the problem was that the way that George treated others and lived his life gave little evidence that the Word of God was living in Him. Through these means of grace, the Word comes alive in us. Is the Word of God living in you today? And then finally, Wesley asked: Do I pray about the money I spend? This question is all about the priorities by which we live our lives. Wesley (as well as Jesus) talked a lot about money. Why do you think that is? Because Wesley knew that then as now, the number one reason why relationships fail is the priorities we place on money. How we spend our money and who we spend it on, goes straight to the heart of the matter. If we truly love Jesus, and seek to be in relationship with Him, then how we give of our time and our money, and our resources should make that love come alive in us. The bottom line that I ask myself over and over again is this: Is my life more about the love of money and material possessions, then it is about the love of Christ? Jesus is much more blunt in talking about our spending decisions when he states: You can’t love God and love money. Before you make the decision to buy something, do you pray about it? Or what about before you go through the drive thru at Krispy Kreme (I can’t believe I’m saying this) or Starbucks (now I’ve gone from preaching to meddling) do you pray about it? Is that the best place that we can spend the resources that God provides for us? What does how we spend our money say about how much we love Jesus and want to be in relationship with Him?” I don’t know about you, what it says about me is that it is a pretty one sided relationship. Christ gives me everything, even life itself, and I give Him back the crumbs. Because here’s the thing that Jesus knew and Wesley knew and that is that everything we have comes from God in the first place. And so for many of us, this question is not really about praying how much we are going to spend of our God given resources, but rather praying about how much of our God given resources are we going to withhold from Him? And whether those decisions are going to draw us closer to Jesus or are they going to push Him away? It is all about our relationship with Him. What are the priorities by which your are living your life saying about your relationship with Christ? I know our time is fleeting, but I think as we start this study we need to understand this, if nothing else. This is not a study designed to help us understand our faith, it is all about practicing our faith. Wesley’s was a practical theology. He didn’t care if those miners and farmers to whom he preached, who made up those first Methodist societies, completely understood the faith, as much as he cared that they live their faith. And he knew that we could not understand the love of God simply through reading and hearing about it. We can not fully understand God’s love until it truly comes alive in us, until we experience it for ourselves. Until our own hearts are warmed. Until the word comes alive in us. Until all there is of our life on this earth, is our relationship with Christ. Molding us through His Grace to live in His image. So when all is said and done, these questions are our invitation to live our life in the light of God’s love and grace. Is Jesus real to us today? Well, look around John. The lame walk, the deaf, the blind see, the sick are healed, the unloved are loved, and the hungry are fed, and the Word is alive and life giving, and Jesus Christ, the Messiah, is still calling you and I to follow Him Is Jesus real? More importantly: Is Jesus real to you today? If so, how do we know? How do we know that you love Jesus? How do we know he’s real for you this moment and every moment?